In an earlier post I briefly discussed the issue of civil rights in Australia, particularly as to how we justify infringing rights in order to deal with specific segments of society. It’s a distinctly worrying trend, but when the decision of the Western Australian government to grant police the power to stop and search citizens without reasonable suspicion of wrongdoing is cast in terms of ‘cleaning-up the streets’ to the benefit of ‘decent families’, as opposed to violent thugs, it’s pretty hard to say ‘Hang on a minute’ without being accused of being with the terrorists. But… hang on a minute. The trend in Western Australia, and Australia generally, should be alarming its citizens. This isn’t just about physical intervention by police forces, but an active campaign of intimidation designed to inculcate a compliant population. As of 2004 Perth was home to the largest single closed-circuit television surveillance system in Australia. 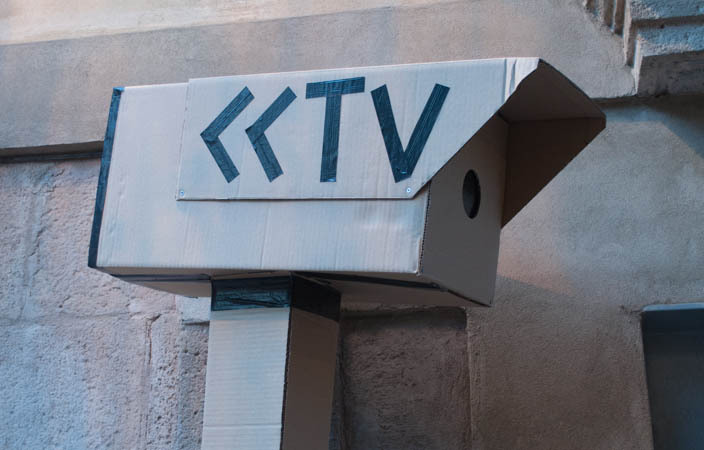 CCTV isn’t about catching crooks; its advocates argue that it is meant to act as a deterrent to crime. Much could be written about the value of deterrents in criminology, but let’s skip that for now. In this instance, deterrence can only mean one thing: intimidation. 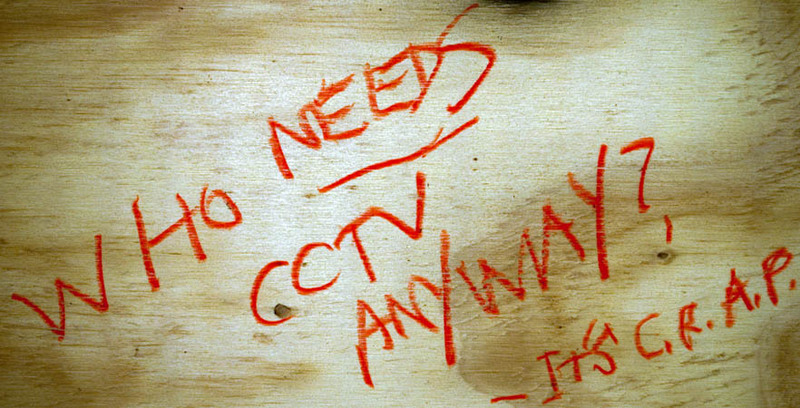 CCTV exists to intimidate citizens into obeying the law. As does the newly increased use of sniffer dogs in police patrols through the city. It’s all very well to say that many of the current laws are beneficial, serve to reduce violence and theft and so on. There are some laws, though, that really only serve to modulate society. Laws about littering or spitting, skateboarding or busking. Intimidatory surveillance is intended to promote fear of prosecution for all unlawful activity regardless of the social merits of the laws that may be broken, laws the passage of which is frequently the result of political maneuvering that may diminish or devalue the interests of minority communities of interest. When we introduce systems of intimidation they serve to enforce a societal rigidity, which arguably makes people more compliant and willing to accept subsequent, more interventionist laws. Like stop and search powers, for example. The Western Australian government has introduced legislation which would enable police officers to stop and search any citizen without the need to rely on a reasonable suspicion of wrongdoing. I guess it’s good that laws which increased the penalties for assaulting a public officer were passed before these new laws: readers can judge for themselves how likely it is that levels of violence against police will increase as a result of being physically searched for no apparent reason other than that an officer doesn’t like the cut of a person’s jib. These powers are not, as some might suggest, the thin edge of the wedge. Western Australia’s legislators have hammered the thing in a good couple of centimetres already. The problem remains, however, that the people that such laws are intended to be used against are actually bad people. I know there’s a whole bunch of romanticism in Australia associated with some criminal organizations, and I also know that drug laws in Australia are not sufficiently effectively enforced (if they ever could be) and so there are people (‘entrepreneurs’?) who are essentially just taking advantage of those circumstances. But let’s not forget that there’s a very high degree of human misery involved in the trade in which these groups so violently peddle. It makes a bit of a mockery of concern for civil rights that the most ardent advocates for their preservation have such obvious and unabashed links with these interests. And if the only other voices raised against this progression towards ever increased surveillance and intervention are lawyers whose income largely comes from defending crooks, it’s going to continue to be pretty hard for the trend to be slowed, let alone halted or reversed. Who from the not-tainted-by-association could or would take a stand on these issues? Until our parliamentarians hear it from the socially pure, it is virtually inevitable that future legislation will become increasingly harsh. If the current advocates, let’s be generous and call them ‘rights campaigners’, really want to make an impact, they need to start broadening the base of supporters of and advocates for their cause. Conventional arms trade treaty – towards less limited limitation? To date, treaties regulating the conventional arms industry have been largely limited to banning specific types of weapon, be that exploding bullets, chemical weapons and most recently landmines. Controlling the trade in more run-of-the-mill things like guns and bullets has only really been considered worth attempting in the past couple of years. The good news of the past week, highlighted for me by UN Dispatch, is that the United States will join talks towards some form of conventional weapons treaty. A draft resolution calling for the commencement of talks on such a treaty has been co-drafted by Argentina, Australia, Britain, Costa Rica, Finland, Japan and Kenya. Previously the US had been inimicable to such a treaty, and there can be little doubt that the previous Australian government would not have sought to co-sponsor a resolution that may have put it at odds with the Bush presidency. How pleasing it is that current political circumstances in both countries now provide an opportunity for progress on this issue. As usual, when Americans talk about weapons their Second Amendment (the right to keep and bear arms) becomes a sticking point. For this reason, negotiations will proceed on the basis that laws regulating internal controls on the ownership and use of firearms will remain the purview of national governments. There has been some criticism, as you’ll see in the cleveland.com link, of the US’ position that such a treaty must be agreed by consensus. These critics suggest that consensus is merely another form of veto, to which might be added that it is a recipe for minimalism. Yet, given the profligacy with which both States and non-state actors expend limited resources on arms and conflict, any participation and agreement by the US – responsible for 70% of the global arms trade last year – has got to be preferable to none. In Australia, they came first for the terrorists… or, why don’t Australians care about rights? Somehow it doesn’t quite have the same ring, but the sentiment behind the famous poem by Pastor Martin Niemöller (with apologies go to the deceased Pastor) about effects of the rise of Nazism in Germany on their political opponents and societal enemies appears to be driving criticism of enhanced police powers in parts of Australia. The suggestion is that the progression in infringement of rights starting with suspected terrorists, followed by allegedly corrupt public officials, allegedly corrupt trade unionists, and now sought to be applied to organized crime (principally outlaw motorcycle gangs) is an ever-thickening wedge of which all right-minded Australians should be afraid. Here’s a couple of example from Australian bloggers. He (see Comments below for gender-confirmation) goes on to cite Jack the Insider’s ‘frustration at “how quickly Australians meekly acquiesce to the loss of these freedoms”’, agreeing that ‘We are pretty meek.’ In comments on the relevant article on his blog, Jack the Insider says ‘I know the thin end of the wedge arguments can be a bit tedious but…’ Quite. I agree that many of the provisions of the respective regimes are authoritarian, but what all of these critics fail to do is come up with any vaguely reasonable suggestion as to which Australians other than alleged criminals will be affected by the infringement of asserted common law rights, some of which really have only ever arguably existed in Australia to begin with. Are they afraid of religious or political persecution? These seem to be the most obvious potential abuses, yet these four commentators at least are not so specific. Basing a pro-rights argument on the defence of the rights of those that are widely accepted to be engaged in pretty nefarious activities, in my view, diminishes the weight of the argument of rights advocates. We end up with the somewhat twisted outcome of alleged organized crime figures as some of the strongest advocates of the introduction of a Bill of Rights. Does that really advance the cause? Don’t get me wrong: I like human rights, I wish we had them. We don’t, and if you want to know why I’ll try to explain it in future posts. I think they’re vitally important, in desperate need of promotion and defence and in all other respects worth fighting for. I’m just not convinced that human rights have ever innately existed. Given what we know about the ways that human beings have treated one another over thousands of years, including on the basis of religious strictures from which these rights supposedly derive, I find it much more credible to suggest that the majority of humanity finally found a means by which to express their exhaustion at – to appropriate a phrase – man’s humanity to man. The elucidation of human rights in the 20th century, then, is not a declaration of rights inherent to humanity but a declaration of the intent of many people to demand them. Maybe that’s a bit of a dark view, but it’s important to recognize the implications of it for how we argue for rights in Australia and the world more generally in the 21st century. If rights are inherent to humanity, as many argue, then aberrant conduct that infringes these rights can be described as inhuman. We can dismiss that conduct as deviating from standards that are universally accepted. The outrage, so the argument goes, is that a person or people would consciously choose to act contrary to these universally accepted norms. That’s a fair bit easier to argue than the proposition I’m advancing, because it constructs human rights observance as the norm. My view is that part of the reason we see rights infringed so regularly is that we still haven’t won the argument that these rights are universal, we haven’t convinced a sufficiently large number of people that we should all abide by these still-new, historically speaking, rights. If this is indeed the more accurate analysis of rights in Australia, then what we should be arguing about is whether or not law-abiding citizens should enjoy rights that do not now exist, rather than whether or not alleged criminals should be protected from the infringement of rights that do now exist. If we don’t have rights as such, what types of protections do we nonetheless enjoy in practice? If we already have these protections, how strong are they and do we need them to be augmented by rights? Where we do not have other forms of protections on matters which might be protected by rights, do we really need protection? What is the real danger or threat posed in regard to these matters? Ultimately, can a scheme of rights really protect individuals from their infringement by the modern state? Are rights considered differently from the perspectives of adherents to parliamentary sovereignty and popular sovereignty respectively? What are the implications of these differences on the debate over whether we should adopt a legislative or constitutional Bill of Rights? More on these questions and others in future posts. Last year a paper of mine on voluntary human shields was published in the Melbourne Journal of International Law. The paper was originally written for the ‘International Criminal Law’ unit I was studying for a Masters degree specializing in International Law at the Australian National University. The title of the article is ‘Voluntary Human Shields, Direct Participation in Hostilities and the International Law Obligations of States’. I’ve put up a link to the Austlii reproduction of the article, and reproduced the abstract below.